In 2013, Jo became an official L.A. Times Food Scout for Pulitzer-prize winning, restaurant critic Jonathan Gold at the L.A. Times. 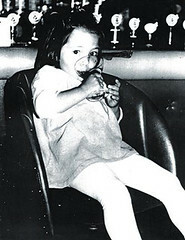 In addition to the Los Angeles Times, she has been featured in the New York Times , Sunset Magazine, Zagat, The Scotsman. Giving back to the community is a top priority for Stougaard. As co-founder of “L.A. 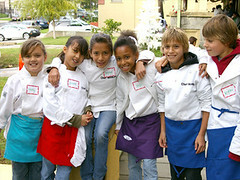 Bites Hunger“, Jo brings together top chefs, restaurateurs and L.A.’s food community to volunteer at the L.A. Regional Food Bank. From her childhood in Okinawa to traveling the world with a wildlife photographer, Jo has spent years photographing every meal. Each morning she tweets food news from her home office in Studio City, which she shares with her husband Peter and three dogs. Half Scottish and half Okinawan, Jo has thoroughly embraced her adoptive home of Los Angeles, California. From off-the-beaten path, strip-mall Thai food to Michelin-starred restaurants, she enjoys it all — one bite at a time. If you’re a food lover (and who isn’t?) follow Jo @MyLastBite on twitter and instagram. MyLastBite shares just the positive and never the negative. If I like it, I share it… If I don’t, I don’t! I am half Scottish & half Okinawan. That’s right… a potent mix of scotch & sake! For the past twenty years I’ve lived in Los Angeles with my husband Peter and a house full of lovable dogs. 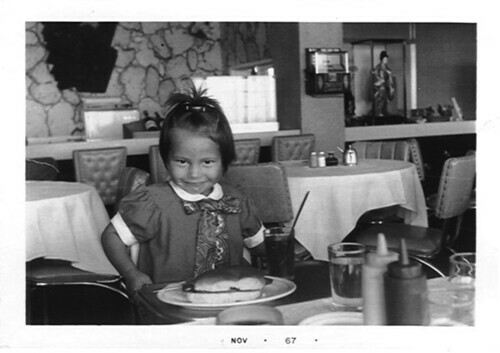 Born in Okinawa, I moved to California with my older sister when I was 8 years old. My mother (she passed away in 2013) lived on an island called Miyako Jima (Okinawa), and my father lives near Glasgow, Scotland in a beautiful village called Bridge of Weir. 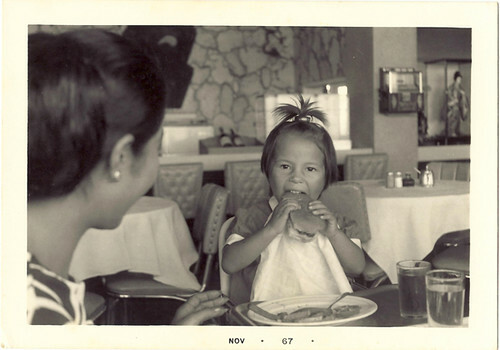 I’ve been lucky enough to travel the world throughout my life, and my best memories are about, you guessed it… FOOD! Visits to my mother, when she lived in Tokyo, meant bowls of udon in the basement of Matsuzakaya department store, and sugar inducing visits to the MilkyWay in Harajuku. Eating dinner at her house was always a yakiniku grill feast. On Miyako Island, my stepfather would go fishing early in the morning and spend the day prepping and cooking his catch of the day, while my mother prepared meats and vegetables for the table-top grill. Late into the evening, we would sit around in our yukatas (a lightweight kimono), drinking awamori (Okinawa style sake) and literally eat ourselves to sleep. Because the chabudai dining table was so low to the ground, you could just lay back on a pillow and pass out! My father’s cooking has been the greatest inspiration to me. Even when we were living in Okinawa during the Vietnam war, he always had the magic touch when he laid out a spread. When I visit him in Scotland now, my favorite meal is always the first night “welcome back” dinner. Whether it’s his perfectly crispy fried chicken, moist burgers stuffed with blue cheese or haggis with “neeps and tatties”, it’s always a delicious family (Clan Maxwell!) feast. One cannot visit Scotland without taking time out for a deep-fried food binge. It’s totally worth the greasy skin and bloating, at least once in your lifetime! Deep-fried meat pies, deep-fried black pudding, deep-fried bangers, deep-fried pizza (my favorite!) and yes… even the notorious deep-fried Mars Bar. It’s not all about the “chippie” (fish and chip shop) in Scotland. I’ve never tasted better salmon anywhere in the world, so I always eat as much as I can get in during one visit. And don’t even get me started on my favorite Scottish beer (not sold in Los Angeles) called VELVET. Just writing this makes my mouth water. 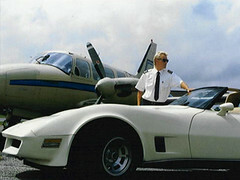 In my early 20’s I was married to an airline pilot named Perry. When he was hired by United Express Airlines (a commuter), we were both eligible for FREE international airline tickets by its parent company, United Airlines. We took full advantage of this amazing benefit! Perry was (and is still) an accomplished surfer so his trips were mostly to places like Hawaii, Indonesia and Tavarua, Fiji. My favorite places included Amsterdam (amazing Indonesian food & other recreational goodies), Italy, France and many, many trips to visit friends in the Greek Islands. I loved the Ammoudi Beach Tavernas on Santorini Island where I ordered freshly caught squid, prepared on the spot. It was on Kythira island where my friend Elli taught me how to make Melitzanosalata (a Greek eggplant dip), and where I learned that “less is more” when it comes to the perfect Greek lemon chicken (lemons, oregano, olive oil and salt). Before the United job, my ex flew for Virgin Air, a small commuter airline in the Caribbean. We found an adorable little apartment in Charlotte Amalie on St. Thomas, U.S. Virgin Islands. Our place had a large kitchen and just one other room with floor-to-ceiling glass windows overlooking the island. Our landlord built a ramp so our dog Warhol could go out the kitchen door and up the side of the mountain. It was paradise and I used to wake up looking at the view and just giggle at my good fortune. The islands fruits, vegetables and seafood were incredible and I probably ate my weight in conch (an edible marine snail). I ate conch salad, conch chowder, conch ravioli and especially loved the deep-fried conch fritters. One of our favorite things to do was to rent a small boat and head to Sidney’s Peace and Love bar on Jost Van Dyke Island. There I would pick out my own lobster off the shore and the cook would grill it to order. My ex didn’t eat seafood, which was a shame but I didn’t mind eating his share! The actual bar was “serve yourself” (oh the rum!) and also “total the bill” yourself if you weren’t too drunk. It was an honor system that you just didn’t mess with in the Caribbean. Perry was (still is) an incredible cook. 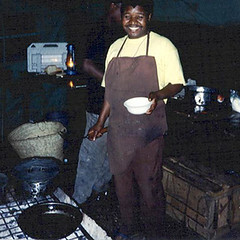 He loved whipping up Indonesian and Indian dishes a few times a week. He was always willing to try new recipes and cooking techniques. When he decided he wanted to make homemade sausage one summer, he drove all around town looking for fresh whale intestines to use as the casings (to fill with the ground sausage meat). 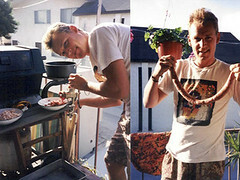 He had sausage and casings all over the kitchen and I admit that it made me a little squeamish back then! We had two major issues in the kitchen. My ex-husband didn’t eat seafood or CHEESE and those are two of my absolute favorites. If I ate cheese in front of him he would taunt me with “you know that you’re eating rotting food right?” We rarely sat at a sushi bar counter because Perry would want to order beef or chicken. But Perry’s Indian curries and Asian dishes were FAR better than any restaurant, and I regret those years in my 20’s when I was a foolish, young, dieting fanatic. Twenty years later, we are both happily remarried and still remain friends. Now he’s cooking all those exotic dishes for his beautiful wife Karen and their two kids. 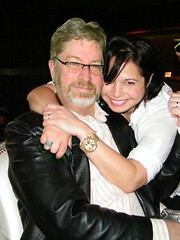 I’ve been with my husband Peter for fifteen years and I’m lucky that he’s also very passionate about food. And yes… he loves stinky, stinky cheese and any type of seafood. In 1992 I started working for Tom Mangelsen, an amazing wildlife photographer who pretty much traveled full time. Those years hopping the globe, learning to photograph and lugging cameras & heavy gear were really an adventurer’s dream. 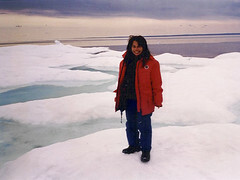 One summer we went on a polar bear photo expedition in Inuktitut, Wager Bay (Canada’s Northwest Territories). The name of the polar bear camp was Sila Lodge and it was located just 60 miles south of the Arctic Circle. It was run by three wonderful Eskimo families, and when I first stepped out of the airplane, the crew pointed me towards the kitchen. I looked like the local Inuits, so they assumed I was there to work. I didn’t mind and actually thought it was pretty cool! Because after searching for polar bears during the day on open boats (seriously freezing our butts off) there really wasn’t much to do way up north! So I happily kept busy with the local kids and spent my down time hanging out with the staff in the kitchen. We ate a lot of arctic char on that trip. Roasted arctic char, poached arctic char, deep-fried arctic char, arctic char & mayo sandwiches… it was all good. On safari in East Africa, I couldn’t wait for meal time. Our trip started and ended in Nairobi, Kenya where we stayed at two luxury hotels. The Windsor Golf and Country Club at the start of the trip and the legendary Norfolk (made famous by Hemingway) at the end. Both of these hotels had all the fabulous amenities that come with a first-class price tag, but my best memory of Africa is when I slept in a dusty tent in the Ngorongoro crater in Tanzania. My first morning waking up in the wild, smelling the breakfast cooking on an open fire and listening to elephants and birds nearby, was for me a dream come true. One of my favorite movies being “Out of Africa”, I thought it was all just perfection. That first breakfast on safari turned out to be our last. Nature photographers love the “golden hour” to capture the perfect shot. That means we had to be in the field before sunrise and stay until after sunset. I was so cranky by 11am. Hungry and resenting my boss for making me miss the fabulous breakfast each day. Our local guide was named Joseph and we quickly became friends. When he realized that I was miserable each morning because I hadn’t eaten breakfast, he started packing extra snacks for me in the Landrover. Simple things like hard boiled eggs with some salt on the side, or a hunk of cheese and crusty bread. It was our little safari secret and I can still remember how to say “can I have my lunch now” in Swahili. It sounds like “toona weeza koola hoppa”. That year we celebrated my birthday on Safari. The camp chef made me a beautiful cake outside the cook tent. I was amazed that they had done that for me and it really touched my heart. How on earth, on the Ngorongoro rim, did he make such a delicious cake? 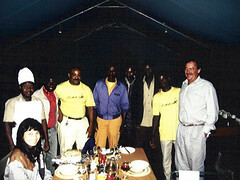 On top of that, the entire safari crew (guides, cooks & drivers) got together to sing “Happy Birthday” to me. It was quite a memorable 30th, that’s for sure! 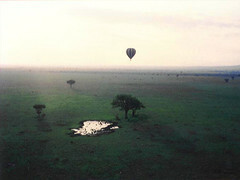 My very favorite food memory of East Africa involved hot air ballooning over the Serengeti plains. It really was as fabulous as it sounds and I’m so grateful that I got to do it. We arrived before sunrise and were prepped for the balloon ride. The basket was large and could fit at least 8 people. It began with each of us climbing in with the basket tipped on its side. 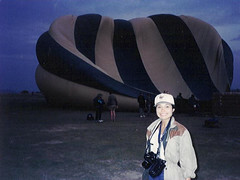 While laying there, the pilot started the fire and the balloon slowly filled with air. It was dark when this was happening, so it was quite dramatic with shooting flames and bursts of noise. I have to admit it was a little bit scary! After lifting off the ground, we all stood up and floated across the grass as the sun slowly rose. To look down and see giraffes and zebras running across the wet savannah, and feel the gentle breeze on your face…. well it was a once in a lifetime experience for sure. But that wasn’t the best part (at least for me). After the hour flight I noticed a fleet of white Landrovers below us, zigzagging along the roads. Landing the balloon was even more exciting than taking off because it’s not so controlled! A few bumps along the grass, heat and air released from the balloons and we were on the ground. I was giddy with joy, and of course stupid with hunger when I hopped out of the basket. The Landrovers were already parked and unpacking at this point. First there was a large wooden crate set on the ground. The pilot flipped open the top and pulled out crystal champagne glasses for everyone. We toasted the beautiful flight and chatted about the spectacular photographs taken from the balloon. When I turned around, the crew had already sent up a large dining table with chairs, crisp linens, silver and more crystal goblets. I wasn’t sure what we were going to be eating, but I didn’t CARE. Just thrilled that there were be some snacks! It was more than a snack. After the balloon burner had cooled down a bit, the crew (with heavy protection gloves) removed the burner from the balloon and brought it close to the dining table. There was a heavy stand set up to hold the burner. 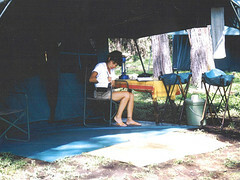 Right then and there, a chef stepped in and cooked a full English breakfast in the middle of the Serengeti. 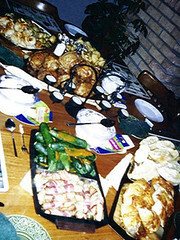 Plump, juicy banger sausages and fried eggs, crispy toast with creamy beans, grilled mushrooms and tomatoes, amazing local coffee, fresh-squeezed orange juice and of course more champagne. Like I said… once in a lifetime stuff. A few years ago I started the “Chef Monkey” cooking club for kids, primarily so I could spend more quality time with my niece Kindal and nephew Chace (twins, now 19). Up until a few months ago, we held regular classes at my sister’s home, but now with the kids after-school schedules so overbooked (soccer, baseball & homework), we hold the club during the summer months only. 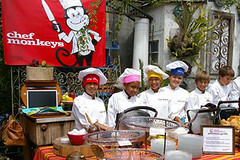 The Chef Monkey club motto is “We Cook Because We Can… Duh!”. A fun and important part of the club is making up songs to help the kids (and us grownups!) remember food terms. I still sing the “Mother Sauce Rap” when I’m making a pot of Béchamel or any of the five classic French “mother” sauces: Béchamel, Veloute, Español, Tomato, and Hollandaise. The Mother Sauce is Wrapped… Out! Over the years the kids cooked for firefighters (at the fire station! ), volunteered at a women’s shelter, and catered special “Panini Night” fundraising events. This past summer we held a “Chef Monkey Cooking Camp” at Alexandria House, a transitional residence for women and children. The Chef Monkeys got to share their joy of cooking with kids less fortunate, and at the end of the lesson we enjoyed the meal together. It was an amazing experience. Below is an audio excerpt from “My Life as a Foodie” by Phil Nigash. His kind words are very much appreciated. your website makes me in a good mood… I can’t get off it, it makes me wants to cook and try new recipes. You’re a lucky woman to be able to travel the world and experience diffferent cultures. Your life just sounds so amazing. It’s wonderful of you to share it with others through Chef Monkeys! Just browsing the net and came across some tasty food and beverages. Dropping a note to say hello and now I’m hungry thanks to you. Hope all is well with you and Peter. p.s. I have your guitar safe and sound, but still unable to play a single lick. 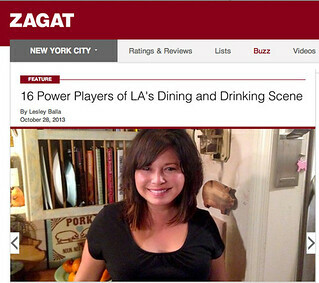 Thanks for visiting FOODalogue and leaving a comment. You’re a very good writer and photographer and I enjoyed my visit here so much that you’ve got a new subscriber. P.S. This is the most interesting “about” page I’ve ever read. You are amazing! What a site! Creativity abounds in your household. Love to you both. I’ve been enjoying your blog for some time now and just took the time to read more about you – what an amazing journey you have had, thank you for sharing it. And I have to tell you that I discovered your blog just about the same time ‘animal’ opened. It’s a neighborhood joint for me and I love introducing my friends to it by sitting at the bar and trying not to order everything. Keep up the great work and the food love! Great meeting you and the Hub last night! Thanks for turning David and I onto Gangadin, it was amazing!!! This website makes me happy!!!! One book I am delighted to announce und you may be for sure interested to know about: FOOD FOR THOUGHT/THOUGHT FOR FOOD: The creative universe of elBulli’s Ferran Adrià. A reflection on the worlds of avant-garde cooking and art. This unique book, published by Actar on 1 July, is edited by Tate Modern Director, Vicente Todoli and the celebrated artist, Richard Hamilton. I attach a press release, press pack and a PDF of the jacket featuring the chef as a Simpson’s character – a special creation by Matt Groenig. There have been launches in Madrid and Barcelona and there will be an event and discussion with the three major players in London 22 June. … the book will be £29.95….It will be published in the USA this autumn (USD 44,95). If you would like more information about this book – please don’t hesitate to contact me. Thanks for the book info Jan! Fantastic! food, travel, photography and family, you have seen alot of adventure! Thanks! And so much more to come! Cheers! Hi Lev, The pork was not overly salty at all. Enjoy! Whoaa Peter loves stinky foods.. durian, petai, terasi? hmm what else I can think from Indonesian cooking. THANK YOU! Finnish/Malaysian mix sounds amazing!! The Hungry Detective suggested I contact you about a food show I’m doing… can you contact me today if possible. Love your site! It doesn’t get any better than the Mother Sauce Rap. Saw your picture on Food Blog Forum and thought I recognised a fellow Halvsie in you – half Kiwi, half Japanese over here…Look forward to reading more! Wow! What an amazing story, my husband and I love to travel but nothing like you! Great pictures and stories, thanks for sharing! I was just randomly following you on twitter, and when I checked your website..I almost died..YOu have pictures with Michael Voltaggio..and some of the prominent chefs…I would love to be acquianted with you- great to meet people with common passion in life..food and travelling. I stumbled on your site via Twitter and am very impressed. What camera are you using, particularly for photos like the ones you took at Seoul Town Tapas? The camera I use is a Leica D-LUX 4. Thanks! 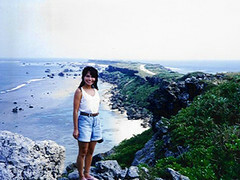 I came across your blog and it made me think of my summers on Miyako Jima. What a wonderful blog. I will make it a part of my daily ritual from now on…anything to put off writing! Hey…I came across your blog by accident! A good accident. I was looking up how to make the “Pearls” in Michael Chiarello’s Oil and Vinaigre…and clicked on your “Fruit Caviar”…Yay! My husband is a retired pilot for Delta and I’m a retired Delta Flight Attendant….Then lived in Paris for a year in ’98 and got a Grande Diplome at Le Cordon Bleu. I love your blog and will keep up! What a nice find. It’s a lot of work to blog. Just saw you on the food network at the Bazaar, good work!!! One day I will see you out at Animal or Laurel Tavern and I will say hello. What an amazing life and story! You should write a book 🙂 I’m glad to have discovered your food blog, I look forward to reading your collection of “My Stories”! Good to see you again. Interesting stie. Dear Jo, your Blog is fantastic. I enjoyed so much your life stories and adventures. Your way of writing about things is great andd you have a true gift about it. A big hug and see you soon at Osteria! Your site, Pork, Food, Pork, Wine, Pork, Brent and more Pork! I will get a “must eat” places from my friend Lindsay. She is a HUGE foodie and lives in Glasgow (and is also my brother’s girlfriend0. What cities are you visiting? I’ll email you when I get more info. Great Blog…It was great to have met you and Han last night at the Cohon 555 event. It was my first volunteer culinary event and I had a great time. I’m taking culinary classes just for kicks and possibly a career change. Thus far, all those who are “in love with food” like myself are nothing but fun people. I suppose the combination of good food, great people, vino, and a few laughs are what it’s all about. Hi Alison, Thanks so much for checking out My Last Bite. A friend of mine (Christine) knows all the best eats in Vegas. I will ask her to comment here for suggestions. Oyster Bar at Palace Station- This is hidden GEM. Randomly at an off strip old school hotel but the pan roast here is AMAZING. bar seating only and first come first serve but this place has a cult following and growing fan list. we always have to make a stop if we’re in vegas. Joel Robuchon Atelier/The Mansion- at the mgm hotel, 3 michelin stars. enough said. (you can just shoot me an email at christinejchoi@gmail.com if you have anymore questions, I have many more recs if you want a specific cuisine! Thank you SO much for this info….. it’s our first trip out there, and it’s easy to end up in the wrong eatery and be disappointed! It’s a celebration trip too, so I think we’ll definitely do the Joel Robuchon Atelier one evening…. and I’ve always wanted to go to Scarpetta (haven’t been to the BH one yet). The other places sound fantastic too, so we’ll definitely seek them out…. The diet can wait until we get back haha! I very much appreciate your website and the content. You have been blessed with amazing experiences and I am so happy you have shared them. I love traveling! I’m so excited for my fall 2011 semester off (interning & traveling through Europe! Eating a ton, too, of course). Those free airline tickets? So jealous. Great to meet you in Hawaii. Loved reading your life story and all your food memories. Wish I’d had more of a chance to talk to you about your Okinawan / Scottish heritage. Hope our paths cross again in future! Thanks Christine! So nice meeting you as well. Just found your blog and read “about you”…very cool! I’m Italian, born in Scotland…living in California, and also have a food blog: http://www.christinascucina.blogspot.com, so we have a little in common! 🙂 Looking forward to following along!